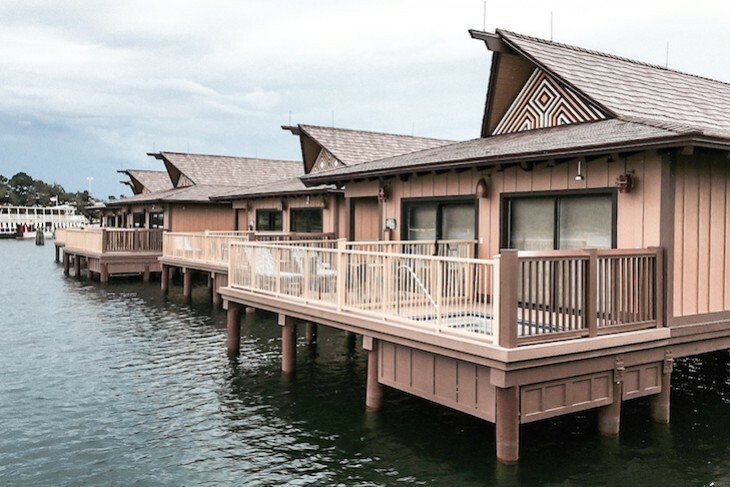 Set within Disney's Polynesian Village Resort is the Disney Vacation Club option of waterside bungalows along the shore of the resort, and Studio Villas located in the remodeled longhouses of Tokelau, Moorea, and Pago Pago, all available for rent to non-Disney Vacation Club guests. 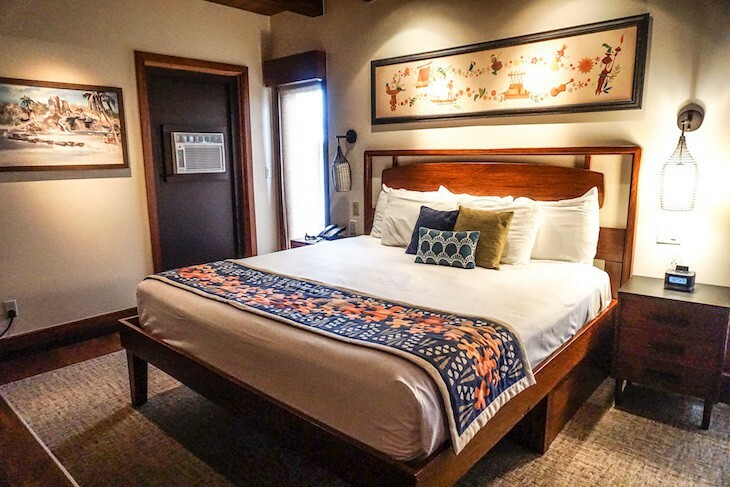 Here mid-century modern design meets traditional Polynesian style with a South Pacific vibe in villas and bungalows privy to all services and recreation of Disney's Polynesian Village Resort..
Check-in is at the resort's Great Ceremonial House with all studios located between the Oasis Pool and the Transportation & Ticket Center making them a convenient walk for a non-stop monorail ride to Epcot or a quick jump on the ferry to the Magic Kingdom. Of course it's still easy walk to reach the monorail in the Great Ceremonial House. 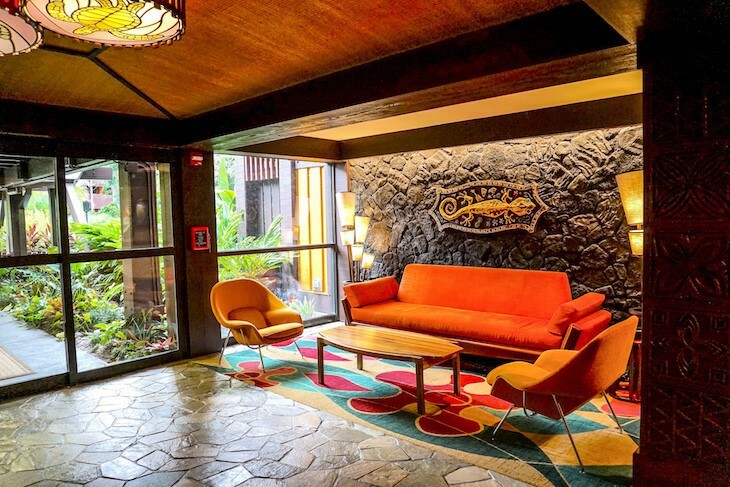 Each longhouse offers inviting seating areas with lava rock-lined walls and flagstone flooring with furnishing that same mid-century modern look with Polynesian elements—think 1950s Hawaii. 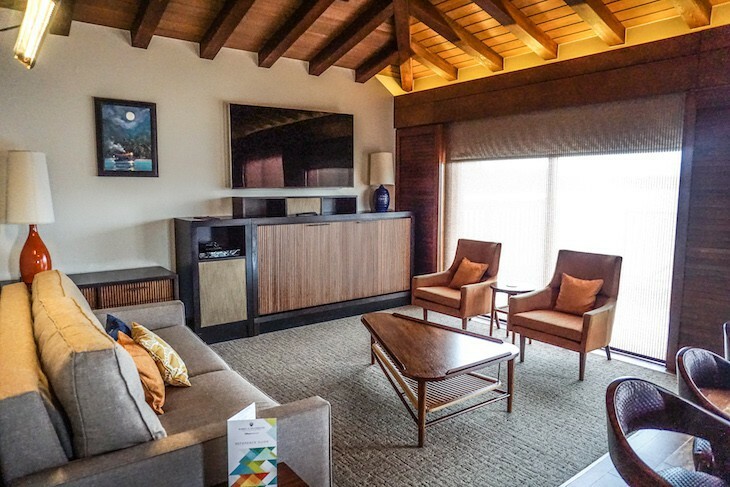 Coveted over-the-water bungalows line the resort's lagoon and offer a two-bedroom, two-bath option. Request a bungalow closer to the Volcano Pool for a quieter stay away from the Transportation & Ticket Center ferries. 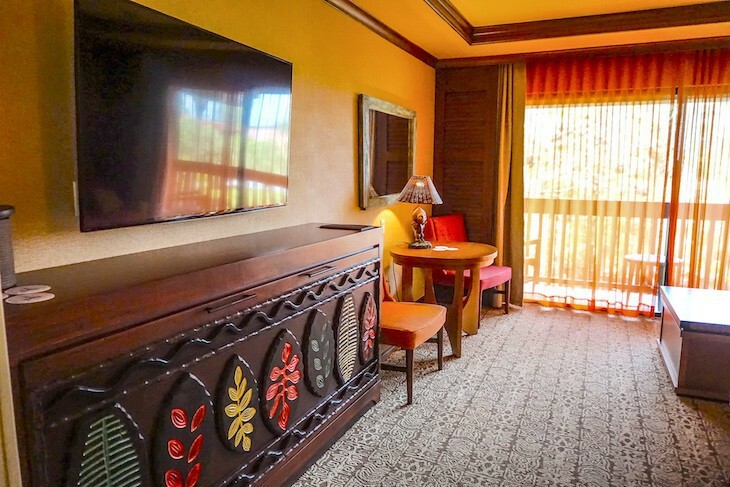 This is a bit different than other Disney Vacation Club properties in that here you'll only find studios and not 1- and 2-bedroom options. 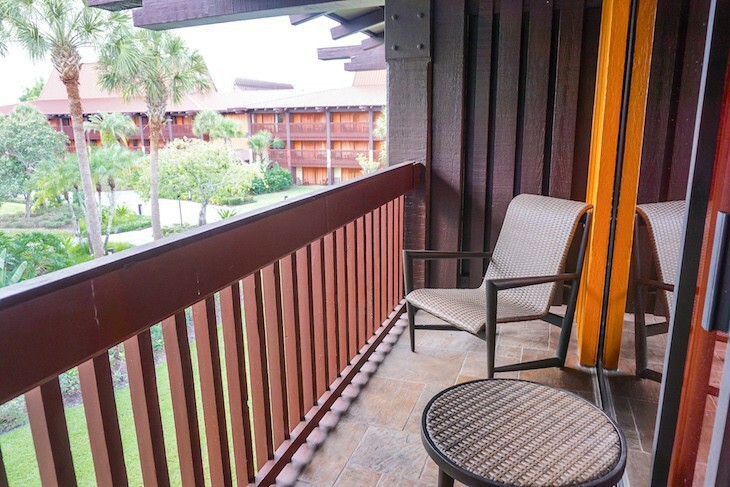 Studios are the same size as the standard guest rooms at Disney's Polynesian Village Resort making them the largest studios in Disney's repertoire. 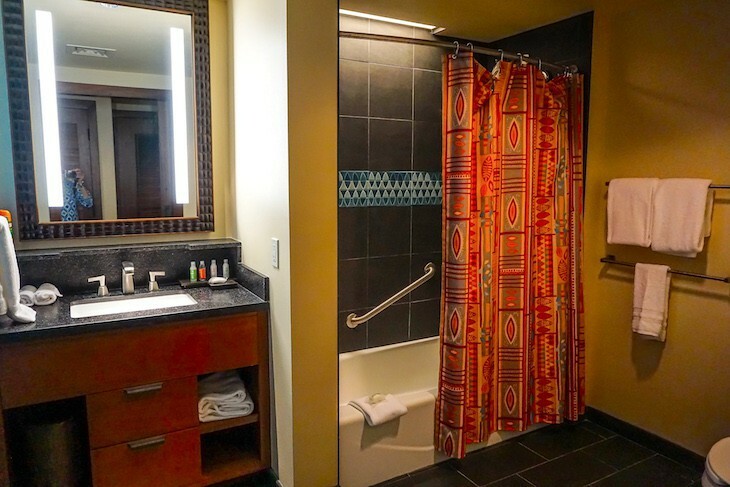 They do differ in decor from the resort rooms with a palette of teal, cherry red, and tangerine, a great split bath layout, and the addition of a small kitchenette. Available in either Standard (view of garden or maybe even part of the parking lot in one side of Pago Pago) or Lake (lagoon) view, each offers one queen bed raised to accommodate luggage underneath, one queen sleeper sofa fronted by a coffee table with additional storage underneath, and a bunk-size pull-down bed. 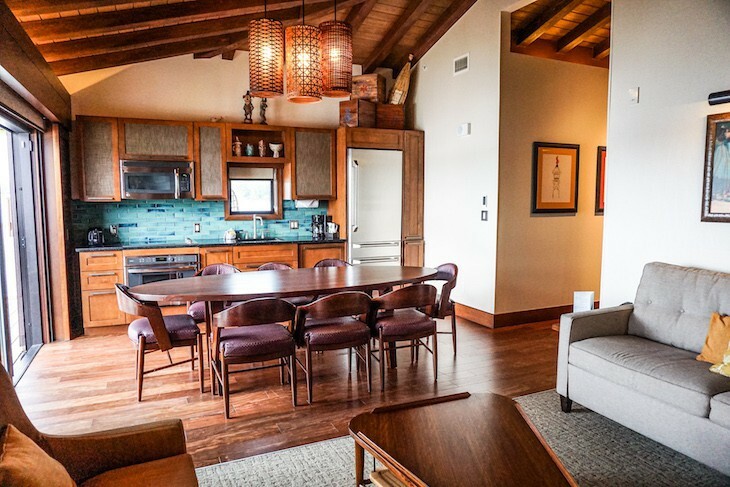 Also a two-person table, tiki god lamp, oversized wall-mounted TV, and carved wood bureau where below the pull-down bed is located. All have either a patio or balcony. 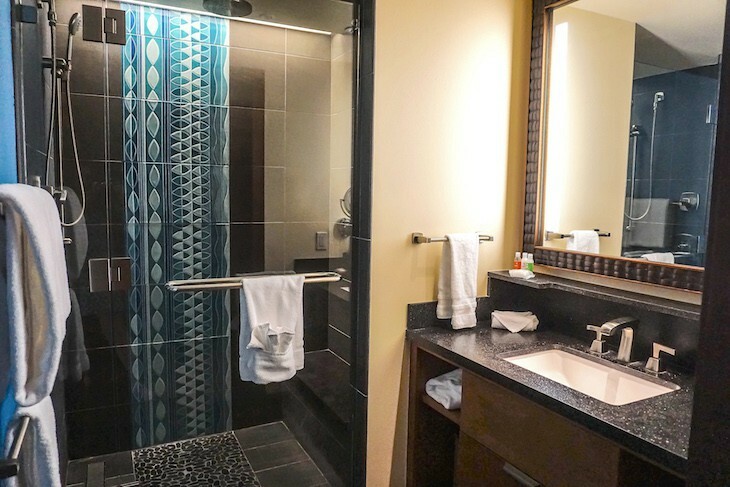 The split bath is similar to those found on Disney Cruise Line ships in that there are two separate areas: one with a sink, toilet, and bath/shower; the other with a pebble-bottom shower and sink. In the hallway is the kitchenette with microwave, sink, undercounter refrigerator, coffeemaker, and toaster. The closet holds a pack 'n' play, electronic safe, iron and board. Best of all, there are a quite a few connecting possibilities to another studio, so your chance of getting one is quite high—of course, it's on request only. Sleeps up to 5 people. 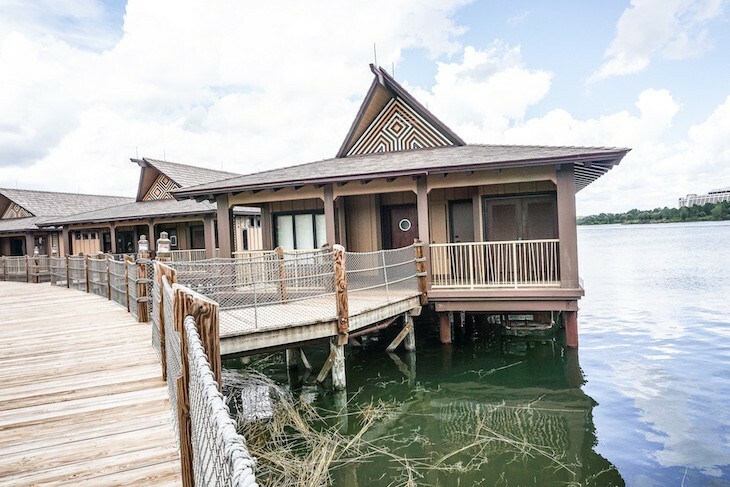 Over-the-water bungalows at Disney! Who would have ever thought it? 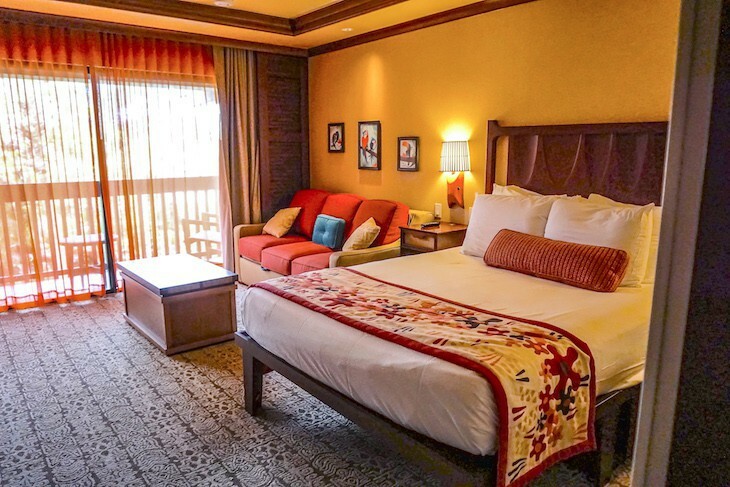 But Disney did indeed, and they are among the most popular Disney Vacation Club villas around. 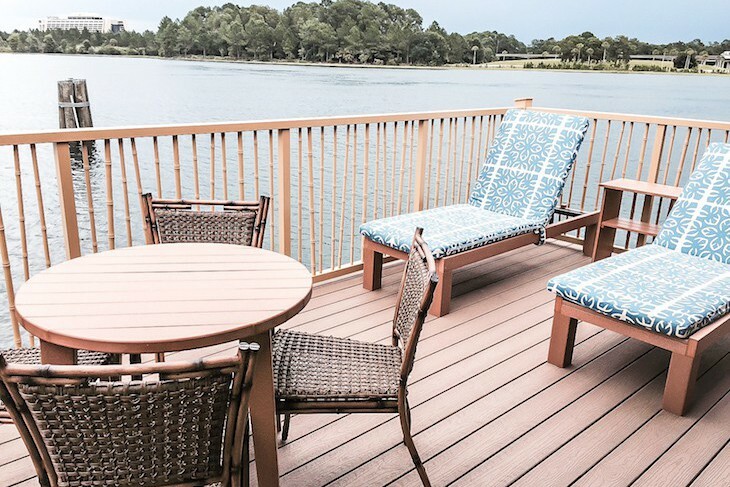 With 2,800 square feet, these two-bedroom, two-bath beauties sleep up to eight people and are accessed through a gated, keyed-entrance boardwalk. 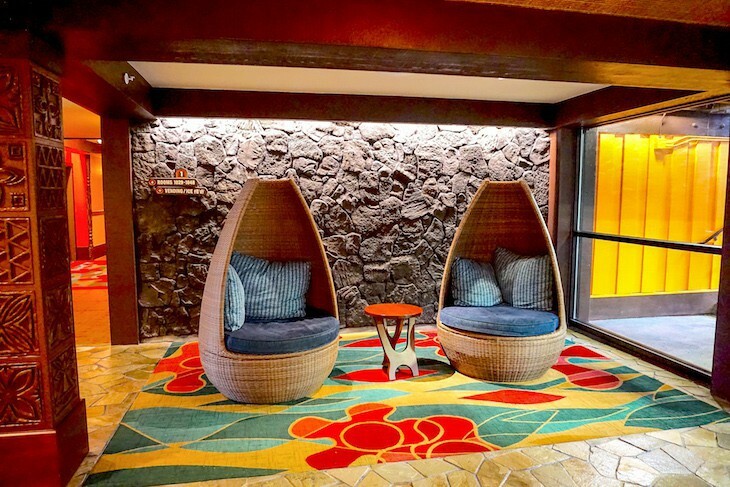 Truly delightful decor evokes a mid-century modern look with a twist of retro-tiki. Distressed wood flooring and lofty beamed ceilings add to the luxury, and the entire bungalow is on a lighting control system. Off the entry hallway are the two bedrooms. In the master is a king-sized bed, bureau, desk, and a large wallmounted TV, but what used to be a 2nd exit off the master bedroom to the back deck is now closed over with an additional A/C unit. 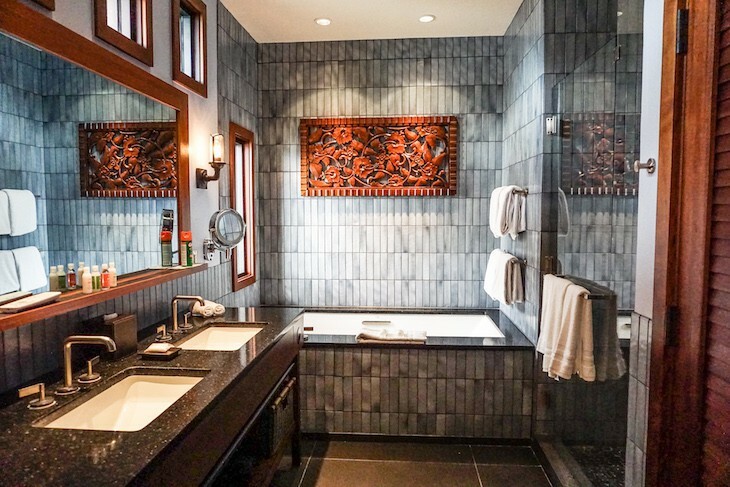 The lovely master bath comes with double sinks in a black granite vanity, a large shower with pebbled flooring and rain shower head, and an oversized whirlpool tub above which is found a hand-carved teak panel. The bonus is a fun in-mirror television! The guest bedroom shouts "beach time!" 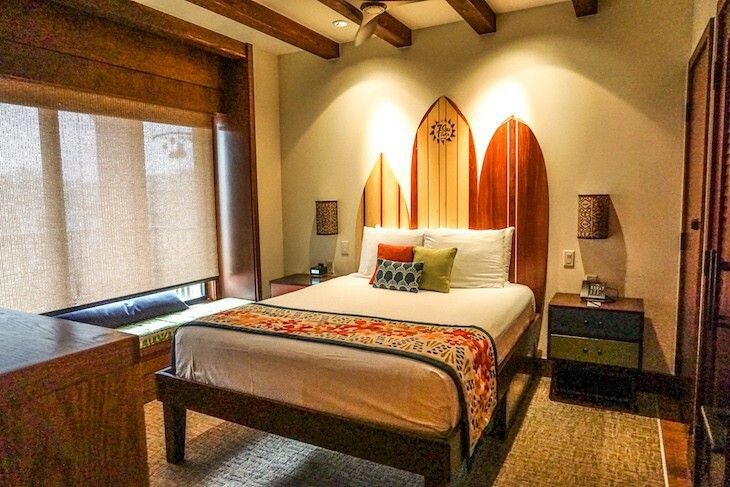 with surfboard headboard queen bed and a great window seat perfect for snuggling up on a lazy afternoon. There's also an additional TV, trundle bed, and plenty of storage. Off the hallway is the 2nd bath in a split configuration with two areas: toilet and sink in one; bath/shower and sink in the other. Off this same hallway is a closet with a washer and dryer. Facing the lagoon is the open floor plan of the living/dining/kitchen area with super views of the Castle in the distance. The living area allows enough room to spread out with a sleeper sofa and two occasional chairs, as well as another TV. 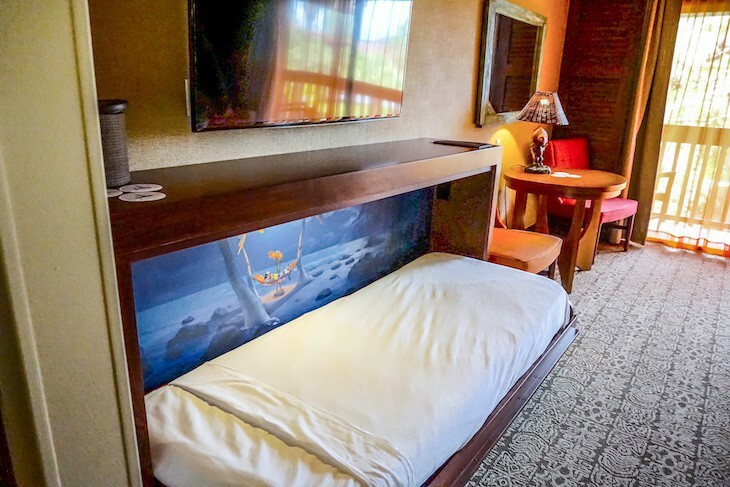 Here also is additional bedding in the form of a fold down bunk-size bed adorned with artwork of the Electrical Water Pageant, seen every night outside your back door on the lagoon. A dark wood dining table located between the kitchen and living area is in the shape of a surfboard and seats eight in burgundy leather chairs. The kitchen is on one wall with a fun teal backsplash, but no kitchen island. It holds a microwave, stovetop, oven, toaster, coffeemaker, and full-size refrigerator with ice maker. Additional amenities are a DVD player, electronic safe, iron and board, and a pack 'n' play. 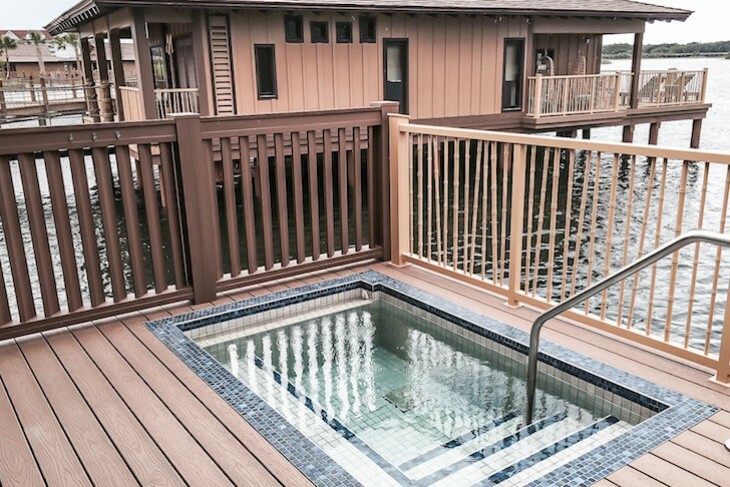 Cool off in your own private plunge pool on the back wraparound deck. Here you can relax padded lounge furniture, and a table and chairs. Best of all are the picture perfect views of the Seven Seas Lagoon and the Magic Kingdom® fireworks (speakers pipe in the music along with the show).